Marissa stared into her Narnia wardrobe cramped with clothes the colour of a hundred rainbows and with designer labels: Dolce, Gabba, Vivienne Francine, Dior. No, she had nothing to wear for the Che Guevara “Come To the Revolution Party” tonight. She needed some combat gear, Dior camouflage green, Louis Vuitton belt with machine gun, and Prada military boots. Saturday was going to be the night of the revolution and what better time to treat herself to an outfit befitting a revolutionary leader. Myers would be a good store for her choice of clothes. 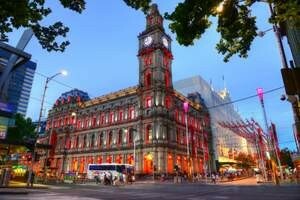 Marissa loved the large, open department store, which had everything from Kath and Kim sales ladies to china teacups, civilized behaviour and, last but not least, toilets that were so clean that Marissa would walk through the arcades in the city just to get to Myers. “Good Oh! Tomorrow is Boxing Day. They should make Boxing Day the sacred holiday, instead of Christmas,” she mused. In fact, she had posted such a comment on Facebook. Christmas was a rip-off because everything hits the roof before Christmas. Cost of presents, she meant. Sacrilegious – don’t they know that with modern families there are at least twenty members to buy presents for. What’s more, one could no longer buy cheap imports from China, India, Indonesia or Africa. One could, of course, and one did, if the presents were for acquaintances, or for the ironing lady or the cleaning lady; however, to impress one’s family and friends, it had to be diamonds or pearls or, for the environmentally informed, something for the garden. Gardening Australia and Bunnings have a lot to answer for. In the Myers Store the crowd waiting outside stretched like the Rainbow Serpent, winding down McLeod Street and around to Grafton Street. They were waiting for the doors to open and for the sales to begin. Marissa is in her usual Miranda lost in the world of Dreamtime state and imagines the gladiators saluting Caesar, “we who are about to shop salute you,” watched by a bloodthirsty crowd, as gladiator fights gladiator and the lions prowl in their cages, waiting for their kill. “Hey, you, how dare you say Boxing Day should replace Christmas as our sacred day? How dare you. You immigrants should go back from where you come from. You are all a bunch of terrorists!” Marissa pales significantly (quite a challenge because she is as dark as night). The crowd has gathered around Marissa and people are looking at her rather angrily. Who is the bloody foreigner who has come to tell them how to live? That is what happens when you start letting Asians, Bolsheviks, gays, lesbians….and whoever into this country of a fair go for all. Marissa looks around helplessly for someone to rescue her. She tries to explain that her erroneous thinking was the result of academics, philosophers, politicians and everyone else telling her that to believe in God was to be ignorant or stupid. As Karl Marx had said, “religion is the opiate of the masses” and all who believe in a universal good – Jesus, Brahma, Krishna, Siva, Allah, Buddha – are mad or crazy. The academics kneel before the god of science. Believe in science, in rational scientific discourse and the world will spin like an apple in space, they intone. Research and statistics are produced ad nauseum to demonstrate how justice, equality and sustainability may be achieved. What Marissa is unable to understand is, if science has all the answers, why then is there so much brutality and cruelty in the world? The only people who can hear the sound of children crying, of women bearing the burden, of caged men, are individuals who think for themselves. Marissa, bored with waiting in the endless queue, decides to text her stream of consciousness thoughts to her Facebook friends. Mahatma Gandhi, Martin Luther King and Nelson Mandela, they all preached against violent revolution, which only replace one brutal regime with another. What is the point of replacing one violent ideology with a similar ideology of colonialism? We have world leaders who have the power to provide water, sanitation, shelter and healthcare for their people. But what do they do when they come to power? They use the rhetoric of “In Times of a Colonial Past” to buy fancy cars, fancy women, live in mansions and jet around the world, whilst their people die in the gutter and their children drink polluted water. Suddenly, Marissa becomes aware of a change in the usual avaricious atmosphere of the shopping crowd. My God! Have her brain waves collided with theirs in a sort of telepathic transfer? The crowd is getting angrier with Marissa. They cannot understand her reasoning. Did Australia not provide her with a home? Granted, if they still had their White Australia policy, they could have kept the lifestyle they had become accustomed to: manicured gardens, good manners and meat and two veg. Now you’ve got people from all over the place, all over the world, demanding equality, justice, and a fair go for all. For Christ sake, they yell at Marissa, does she not realise Aussies actually coined the term? The crowd becomes more abusive. They tell Marissa that Indigenous people don’t want no education, or fancy houses, or wealth. All they want is to live their Dreamtime lifestyle on their land. They want to live like Rousseau’s native in a paradise before the time the white man cometh. The noise and aggression are too much for Marissa. She realises she is having a melt-down, because she is defending politicians, for Christ sake! Marissa in her usual Marissa fashion has had enough of this circus. She stops apologising. She puts her hands up to protect her face, throws her head up, stands like the Karate Kid when he is about to kick the kneecaps off the six foot, lean, mean, muscle machine of an opponent. And she walks away from the startled crowd. Bhama Daly was born in Kuala Lumpur. New horizons beckoned and, in the 1970s, she pursued a career in nursing in London. She migrated to Cairns with her husband Simon in 1978. They have two sons. 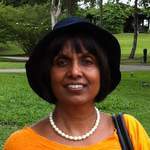 Bhama’s career has embraced not only nursing but also academic work at the University of Queensland and the James Cook University, Cairns. Her research and writing are informed by stories, myths and legends and the way in which they provide explanations for being in the world. Bhama’s interests include writing, reading, Yoga, Tai Chi, Zumba and, a topic of endless procrastination, how not to write the best-selling novel.